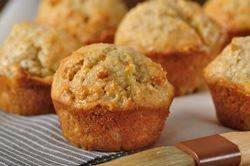 Orange Pineapple Muffins taste of orange, pineapple, and pecans and what makes these muffins extra special is that, while still warm, the tops of the muffins are brushed with an delicious orange glaze. This glaze not only adds flavor, but it also keeps the muffins wonderfully moist. These are lovely little gems that are baked in miniature and I often serve them for dessert with a fruit salad but they are also perfect for breakfast served alongside some yogurt and fresh fruit. There is a women's volunteer organization called the Junior League that produces excellent community cookbooks. Founded in 1901 the Junior League is committed to developing the potential of women and to helping their communities. One way they raise money is through community cookbooks, with each cookbook being a unique collection of recipes reflecting the personality of the place where it was written. You may wonder why I am talking about this organization. It is because over the years I have collected and subsequently cooked from many of these cookbooks. One favorite of mine is Portland's Palate which was produced by The Junior League of Portland Oregon and that is where I found, and adapted, this great recipe for Orange Pineapple Muffins. Orange Pineapple Muffins: Preheat your oven to 350 degrees F (180 degrees C) and place the oven rack in the center of your oven. Butter, or spray with a nonstick spray, 36 miniature muffin tins. In a large bowl, whisk to combine, the flour, baking soda, baking powder, salt, and orange zest. In the bowl of your electric mixer, fitted with the paddle attachment (or with a hand mixer), beat the butter and sugar until light and fluffy (about 2 - 3 minutes). Add the egg and beat until incorporated. Scrape down the sides of the bowl as needed. Then beat in the sour cream, and the orange and vanilla extracts. Add the flour mixture and beat just until incorporated. Fold in the pineapple and chopped pecans. While the muffins are baking, place the sugar and orange juice in a small saucepan and heat until the sugar has dissolved (can also do this in the microwave). Remove the muffins from the oven and place on a wire rack. While the muffins are still very warm, brush the tops with the orange glaze. The muffins can be covered and stored for two to three days, or they can be frozen.